Discover the natural and cultural highlights of Costa Rica's Caribbean side with a guided half-day shore excursion from Limon. Explore local shops and learn about the importance of this busy trading port on a city tour, and get an up-close look at one of Costa Rica's most famous exports with a visit to a banana plantation. There’s plenty of time to connect with the country’s famous biodiversity too, with a visit to a sanctuary for rescued sloths and a canoe cruise down the tropical Tortuguero Canal. Around 30/60 minutes after your arrival. Meet your guide and small group at the cruise terminal at your chosen time, and begin by heading into the heart of bustling Limon, Costa Rica’s crucial import and export hub. Learn about Limon’s history and modern culture as you take a look around the old city center, enjoying time to browse for souvenirs at local shops. Your guide is available to answer any questions and share local insight into this modern Central American city. Depart the hustle and bustle for a visit with Costa Rica’s famously slow-moving mammals at a sloth sanctuary, where you can coo over baby sloths at the nursery and meet resident sloth Buttercup. To protect the well-being of the animals, guests don't directly interact with sloths, but you will learn all about the lifecycles of these fascinating creatures and how they are rescued and rehabilitated at the sanctuary. Continue exploring Costa Rica's wild side with a 1-hour canoe trip down the Tortuguero Canal. Keep an eye out for sightings of howler monkeys, birds, crocodiles, and other animals that make their habitat near the water’s edge. 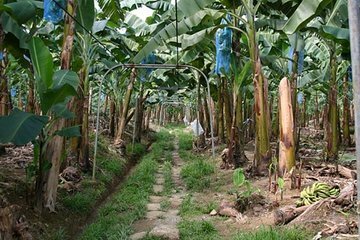 Get an inside look at one of Costa Rica's most popular exports with a visit to a banana plantation. Learn how the tiny nation became one of the world’s largest banana producers and see how the sweet fruit is cultivated, packaged, and shipped all over the globe. Then, take a brief trek through the Jungle Trail (1km), a scenic forest filled with various flora and fauna. Along the trail, look for the different frog species of Costa Rica, such as the Red Dart Frog. You may also spot three-toed sloths, butterflies, and birds, including toucans, oropendola, tanagers, hummingbirds, kiskidees, and more. Afterward, drive back to your cruise port, where the 5-hour tour finishes. Very disappointing. Anna the guide/driver was great but we were in an old bus. SYL tours had a guide and driver with a much newer bus. They did the same tour as us for a much lower price. Why were we originally charged $136pp and their tour was $89pp???? So what we were 4 people- they were only 8! !